Alex practices intellectual property law with an emphasis on patent and trade secret litigation and licensing at Carlson Caspers. She draws on her engineering background to represent clients in the pharmaceutical, medical device, and agricultural industries. Alex has extensive experience defending generic pharmaceutical companies in Hatch-Waxman ANDA litigation. Most recently, she was a member of the team representing a top manufacturer of generic pharmaceuticals in patent litigation involving a chemotherapy drug. 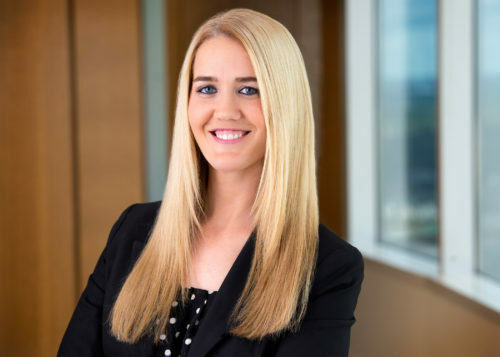 In addition to her litigation practice, Alex also drafts and negotiates IP-related agreements, including patent licensing and research collaboration agreements. As part of the legal team for the world’s leading developer and supplier of advanced plant genetics, Alex assisted a Carlson Caspers’ client in securing a non-exclusive license for a patent portfolio, governance framework, and standard licensing terms relating to CRISPR-Cas9 (Clustered Regularly Interspaced Short Palindromic Repeats) genome editing technology. Minnesota Lawyer named Alex as a 2018 Up & Coming Attorney. Minnesota Super Lawyers has recognized Alex as a “Rising Star” since 2015. She was featured in the Attorney at Law Magazine “2018 Women in Law” Minnesota Edition, which celebrates women attorneys who exemplify excellence in the Minnesota legal profession. Alex is also active in the legal community, and is a member of the Minnesota Federal Bar Association and Minnesota Women Lawyers. She has also provided pro bono representation through the Volunteer Lawyers Network and the Pro Se Project, a collaboration between the Minnesota District Court and the Minnesota Chapter of the Federal Bar Association. Alex currently serves on the Carlson Caspers law-school–outreach team to educate and recruit college students who are interested in legal careers and are pursuing engineering and technical degrees required for most patent attorneys. She is a member of the firm’s diversity committee and regularly participates in meetings and events for several minority bar associations. During law school, Alex clerked as a judicial extern for the Honorable Randy J. Holland of the Delaware Supreme Court and performed research in the areas of patent and trademark law for Professor Mark Janis. Prior to law school, Alex earned her degree in chemical engineering with a focus on biochemical engineering. As an undergraduate, she conducted research in the area of nanotechnology, with a focus on photopolymerization kinetics. Rotary Systems v. TomoTherapy Inc.